John R. Brinkley, a doctor practicing in Milford, Kansas, established a radio station that he hoped would entertain his patients. In 1923 he received a license for radio station KFKB, known as Kansas First, Kansas Best. While not the first station licensed in Kansas, KFKB was groundbreaking in many ways. Brinkley promoted his medical activities and provided entertainment to his listening audience in several states, as well as the hospital. He was a pioneer in radio entertainment. KFKB operated at 1,050 kilocycles with 5,000 watts power. 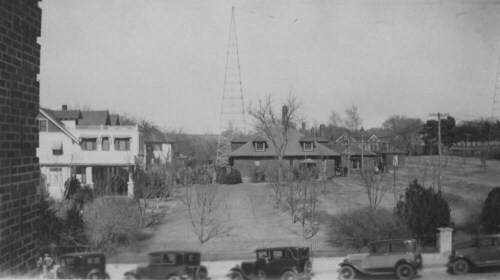 The station was licensed on September 20, 1923, to the Brinkley-Jones Hospital Association, and operated until June 3, 1925. On October 23, 1926, it was relicensed to J. R. Brinkley. The station became popular for its entertainment schedule. Music, lectures, weather, politics, baseball, and national events were among the programs. On the station Brinkley promoted his goat gland surgeries and read letters of testimonials on air. Three times a day Brinkley prescribed medicine over the air in response to letters from patients and listeners. He referred his listeners to a statewide association of druggists and suggested prescriptions by number. The state medical board and the Federal Radio Commission objected to this use of the airwaves. Through the radio station he promoted his 1930 campaign for governor of Kansas. As a write-in candidate, he instructed listeners how to cast their votes. He used his private airplane to fly across the state during campaigning. Brinkley lost the close to Harry Woodring. Brinkley’s license renewal was denied in 1931 after claims of indecency had been filed against the doctor. The state medical board revoked Brinkley’s license for unprofessional conduct.